NZ activist film $3 door charge. 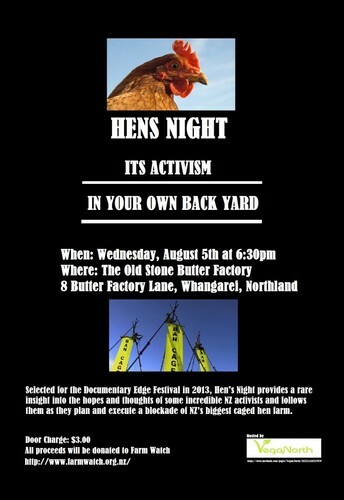 Hens’ Night is ruffling the feathers of the egg industry as it documents a group of Animal Rights activists organizing and executing a blockade of NZ’s biggest battery hen farm. Their plan is to halt production at a Dunedin factory farm in order to bring attention back to the twenty year campaign against hens in cages. We follow three Auckland women as they work with NZ Open Rescue. In bringing their fight to the factory farm by perching on seven meter steel tripods in one of the nation’s most prominent and controversial campaigns against animal cruelty.